Congratulations to Tammy, the winner in D.L. Sparks' giveaway. Thank you to all who participated. D.L. 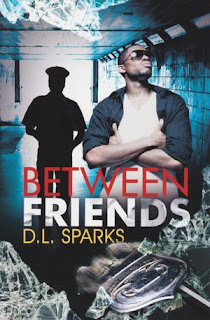 Sparks is the best selling author of: All That Glitters, The Lies That Bind and Between Friends. Her novels are repeatedly best sellers on Black Expressions and has been embraced by endless readers as far away as London and France. Ms Sparks has also been voted one of the Top 25 Most Influential Black Fiction Writers on Twitter by The Best Damn Creative Writing Blog. [D.L. Sparks] I enjoy walking that fine line between bliss and tragedy. It's all about the not knowing. And just when the reader thinks they know proving to them they essentially know nothing at all. Happily ever after and warm and fuzzy is easy to write. Suspense takes on a whole new form of writing and the way the writer sees the world. For instance a strictly romance author may see a couple ride off into the sunset and drop their pen satisfied. A romantic suspense author may see that same couple ride off into the sunset all the while knowing there is a psychotic ex waiting around the corner to exact revenge. [D.L. Sparks] LOL! It definitely pushes your mental limitations. I mean just some of the things I've Googled alone would probably be enough to either get me locked up or certified. When researching a character or situation, for me it's law enforcement/crime, I have a lot of different avenues. And research for me is very important and I dig deep when I do it to bring my story to life as much as possible. So imagine someone tinkering around in my hard drive and finding a search for: How to make a suicide look like a murder. LOL! As far as physical danger I'd have to say no. Unless you're riding shot gun during an arrest or bust you'll be fine. [D.L. Sparks] Not while I was awake. But I have definitely had dreams where I found myself in the middle of a scene and it scared me enough to wake me up. One of my DEA agents ended up on a hit list and of course there were people after him to keep him from solving the crime. Well in my dream MY name popped up on a hit list and I remember being surrounded by people trying to protect me and figure out where to hide me. It was a very tense and scary moment. I have to say I was very proud of myself. LOL! [D.L. Sparks] With this book the biggest blooper would have to be my cover. It doesn't reflect my writing style or the story very well at all. I worked hard to get it changed but guess I didn't work hard enough. LOL! It just doesn't scream "Romantic Suspense" to me. Which presented a huge challenge for me in promotion. My first book The Lies That Bind, there was no doubt but this one….the cover leaves much doubt. Also, I think every writer has read through their books and found something they either wanted to change and forgot or should've changed and didn't. It comes with the territory. We live in a world surrounded by words and sometimes those words run together and it's very easy to get cross-eyed when you're working. It's like when you stare at a word so long it starts to look like you spelled it wrong. LOL! [D.L. Sparks] That all writers are addicted to coffee. No…wait. That may be true. LOL! I think the biggest one is that we're all introverted loners who don't like to be around other people. Actually it's the exact opposite. Writers thrive off of the creative energy that comes from being around friends and family and especially other writers. We are creative by nature and gain inspiration from all the things around us. So that could be as simple as a night out with the girls or a quiet evening at the movies with a friend then walking the mall people watching. We're writing even when we're not. I understand that you have a very admirable dedication for all of your novels. Would you share that with us? [D.L. Sparks] My novels are dedicated to my best friend Monica Bowie who was abducted in July of 2007. She was never found and not much has been done to keep her case alive and in the spotlight. In addition to her I include other missing women whose cases, like Monica's, have been swept aside and forgotten. It's my way of keeping their names circulating in some form and letting their families know that not everyone has forgotten. D.L. will be offering a print copy of BETWEEN FRIENDS to one lucky commenter! Giveaway ends 10pm EST June 22nd. Please supply your email in the post. You may use spaces or full text for security. (ex. jsmith at gmail dot com) If you do not wish to supply your email, or have trouble posting, please email maureen@justromanticsuspense.com with a subject title of JRS GIVEAWAY to be entered in the current giveaway. This giveaway is applicable to US and CANADA addresses only. What draws me the romantic suspense genre is the relationships coupled with danger. Your story about the abduction of your friend is so very touching, and sad. Your dedication is sweet! THIS SOUNDS LIKE ANOTHER TERRIFIC READ THANKS FOR THE CHANCE. This book is a wonderful dedication to all those missing people out there. Because these people are never found, the families never had closure. This book sound interesting for me to read. Very nice interview. That's great about the dedications. What a great interview! I admire anyone who has the talent and desire to write and I'm touched by your dedications.